If you find yourself in charge of making improvements and doing repairs around your home, having a rotary tool kit is a must. The leading brand in terms of this tool is Dremel. However, there are competing options even in the brand which can make it tough to decide which is the right one to purchase, especially when your choices are the Dremel 3000 or the Dremel 4000. Thankfully, that’s where we come in to find out what sets them apart and which is worth your money. These two tools look very similar and can be used for all the same things, but there are differences in terms of the performance you can expect, as well as what attachments and accessories come with the rotary tool kit. While either of them can be a good option, we wanted to share more about the differences between the two to ensure you are able to make an informed choice. Looking at the table above, you’ll see some differences as well as similarities. One of the biggest differences is in terms of the motor size. 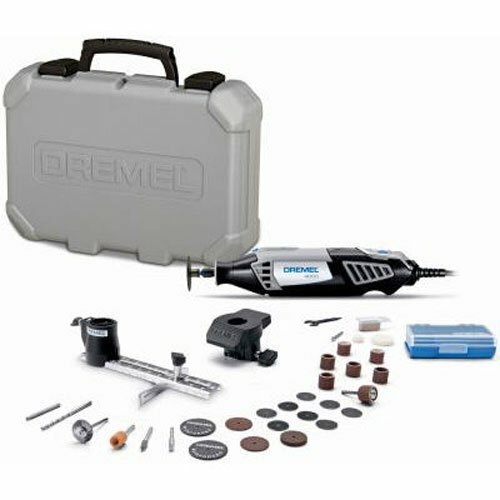 The Dremel 4000 is more powerful as a rotary toll because it has the use of a 1.6-amp motor, while the Dremel 3000 only has a 1.2-amp motor. The 4000 model also has a higher top speed than the 3000 with speeds of up to 35,000 RPM compared to 32,000. However, both are variable speed so you can alter the speed based on what you are doing. Other differences of note include the fact that the 3000 model does not have electronic speed control or a speed dial, but the 4000 model has both of those things. No matter which you choose, though, changing out accessories is simple with the use of the EZ Twist Nose Cap. Now that you have a grasp on the biggest things to think about, we have some more food for thought to share with you. 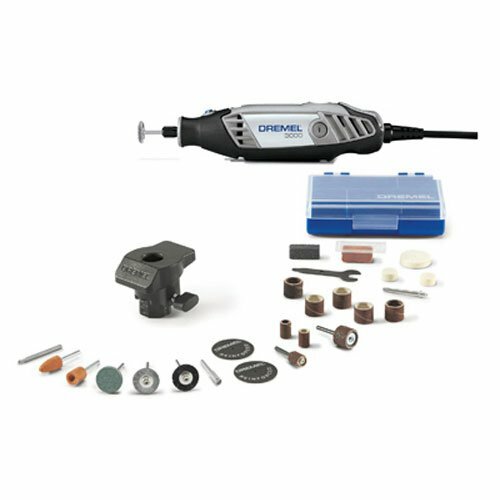 When the Dremel 3000 hit the market, Dremel rotary tools did not come with electronic feedback control. However, that is present on the 4000 model. This feedback control is something that gives you a sign if your speed is off or if you are grinding too hard in order to ensure your project is the best it can. This is left up to your own judgment with the 3000 model, while the 4000 will provide a better level of control. If you are a beginner to rotary tools, the 3000 may cause you to have more mistakes. Those who are well-versed using the tools, on the other hand, may not care about whether the feature is present or not. The Dremel 3000 and 4000 both include variable speed control, but the 4000 takes things a step above by also offering an on/off speed dial. This is a simple way to change the speed without doing anything with the power that makes the 4000 slightly better in its own right. This means that you can speed up or slow down the rotary tool even while in the middle of a cut to ensure the best result on the project. This can be extremely useful if you plan to use the tool for woodworking or craft projects that require a bit more precision. While you may notice there aren’t a ton of differences between these two tools, they do have a large difference in terms of the pricing. As you might expect, the Dremel 4000 is a more expensive option than the 3000. This is because it has more features and is considered better overall. Those who want the best tool possible are going to want to spend a bit extra to get the 4000, but some people may not find that the differences justify it. The reality is that both tools work well and bring plenty of durability to the table, so you won’t be going wrong, regardless of which you end up choosing in the end. Both models here are designed with the end user in mind. You’ll find that they look sleek and are ergonomic in nature so you can use them frequently and for long periods of time without any problems. When it comes to design, there isn’t much that makes one rotary tool better than the alternative. One has a bit of a darker color but that isn’t going to have any effect on using the tool itself. In addition, both of the tools are corded so you get the same effect either way you go. As you might have expected, the Dremel 4000 is a bit better than the older Dremel 3000 model. However, for those who are new to this type of tool, the 3000 will likely meet your needs and offer a break for your pocketbook at the same time. Those who are pros at using rotary tools are likely to find the 4000 more appealing and feature-packed. It has better power and a versatility the 3000 cannot match. There are pros and cons regardless of which you consider the best rotary tool kit, so find the one that meets your needs.